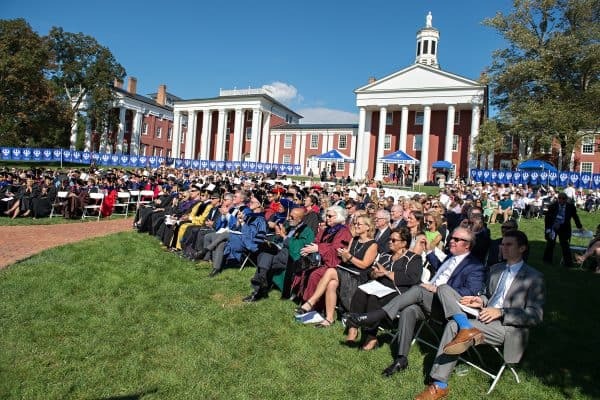 Washington and Lee University inaugurated William C. Dudley as the university’s 27th president in a ceremony on the Front Lawn of the campus Saturday, Sept. 16. Inauguration activities kicked off Friday afternoon with a panel discussion on “Liberal Arts and the Professions.” The panel was moderated by Suzanne Keen, dean of the College and Thomas H. Broadus Professor of English. Panelists were Kelly Evans Chemi ’07, representing journalism; William H. Miller III ’72 representing finance; Dr. Harold E. Varmus representing medicine; and the Hon. Gregory H. Woods representing law. 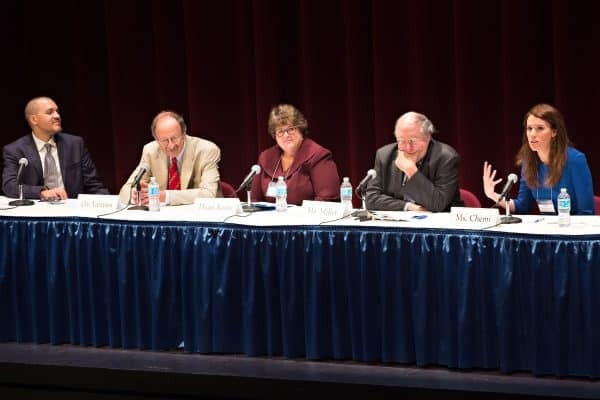 The panelists, all of whom received undergraduate degrees from liberal arts institutions, discussed the benefits of a liberal arts education, and the resulting influence on their varied careers. Saturday’s inauguration ceremony began with a performance of “America Singing,” an original composition by Shane Lynch, associate professor of music, and commissioned in celebration of the inauguration. The piece was performed by the University Singers, accompanied by students Bethany Reitsma ’20 and Tiffany Ko ‘20 on the violin, Allie Jue ’20 on the viola and Emma Rabuse ’20 on the cello. Greetings were offered on behalf of faculty by Theodore C. DeLaney, associate professor of history, and Joan M. Shaughnessy, Roger D. Groot Professor of Law. Mary S. Woodson, director of publications, spoke on behalf of the staff; T. Mason Grist ’18, president of the student body, spoke on behalf of students; Michael R. McGarry, ’87, president of the Alumni Board of Directors, represented alumni; and Lexington City Council member Marylin E. Alexander welcomed Dudley on behalf of the community. Following introductions by Gregory M. Avis, former chairman of the Williams College Board of Trustees, and Steven G. Poskanzer, president of Carleton College, Dudley addressed the crowd gathered for the ceremony. In his remarks, Dudley built on the foundation laid by Friday’s panel in stressing the importance of the liberal arts in today’s world. Dudley began by clarifying the meaning of liberal arts with a comparison to the martial arts. “The ‘martial arts,’ literally, are the disciplines that prepare you for war,” said Dudley. “If the martial arts are the disciplines that prepare you for war, the liberal arts are the disciplines that set you free. In describing the value of a liberal arts education, Dudley said that, “although liberal arts education is the antithesis of job training, it also happens to be the best form of professional preparation. It expands our horizons, develops our capacities, and increases our flexibility. Nothing could be more valuable than that in the 21st century. The liberal arts are not soft and weak but, like the martial arts, devastatingly powerful. In addition, he cited the university’s role in making an important contribution to the current debates about the ways that the histories of slavery, the Civil War, and segregation are told and memorialized. 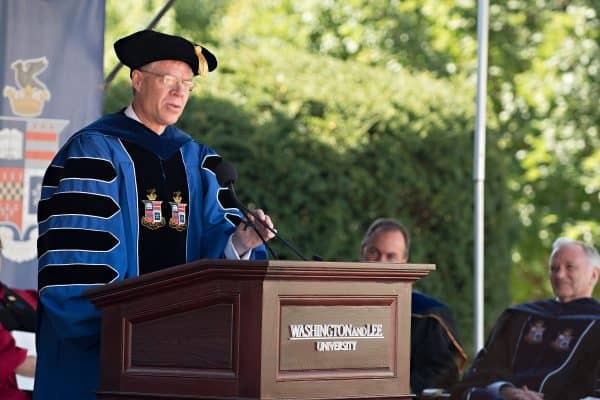 In attendance at the inauguration were past university presidents H. Laurent Boetsch, Jr., who served as acting president from 2001-2002; Thomas G. Burish, president from 2002-2005; Harlan R. Beckley, acting president, 2005-2006; and Kenneth P. Ruscio, who served most recently from 2006-2016. In addition to the past presidents, students, alumni, faculty and staff, delegates representing 65 universities and colleges, and five learned societies and educational organizations, were present for Saturday’s event.